The Leaders in Training Program is a leadership development program designed to provide teens with the skills and knowledge to interact and communicate successfully with individuals and lead groups of all ages in a fun, safe environment. NOW REGISTERING FOR 2019 LEADER IN TRAINING PROGRAM! Personal disciplines such as responsibility, patience, service, punctuality and persistence are developed and nurtured during the week-long LIT sessions. While still taking part in typical camper experiences (attending activities and participating in camp events), the LITs have unique opportunities and responsibilities separate from the rest of the camp. LITs will have the chance to lead an all camp activity and assist younger campers on registration days. Each year, the LIT group has completed a service project on camp property. Projects in the past have included canned food drives and a Hoops for Healing basketball event to benefit research at Children’s Hospital and a clothing drive for Matthew 25 Ministries. The service project is designed and completed by the group and few limitations are set as for what can be accomplished. In order to gain the most from this program, we work closely with Kids First Senior Staff and camp staff. Participation is this program will help teens feel confident in the knowledge, experience and leadership skills needed to apply for a position working with children and be more confident decision makers and leaders within our community. Participants meet and are mentored by camp counselors and Kids First staff. Unlike counselors, however, LIT's are always supervised by staff when working with campers. MENTORING PROGRAM - LIT's will be paired with a mentor leader in our camp staff that they will get to know better and grow from throughout the summer. They can ask them questions about working at camp, preparing for a job, interviewing, expectations, etc. We hope that this will allow for more community sharing and teamwork in our program. Please review the 2019 Camp Handbook for other details. Applications are available below. Much like a job application, the first step of the program is the application. It will help us to know you a little better, and put and your gifts and skills into camp. After we receive your application, we will call you to set up and interview over the telephone. Soon after the interview, we will let you know if you have been accepted into the program. All 3 of your references must have been returned to us before April 1, 2019 for your application to be considered complete. (Please hold your summer camp registration until this time). We highly encourage you to turn in your application as soon as possible,and keep in contact with your references to make sure that they return your reference to us as soon as they can. As part of the LIT camp, we strive to provide the teens with some team field trips in addition to the Camp-A-Palooza field trip each week that they will be assisting on. The cost of these field trips are factored into the price of LIT camp. Field trips will be paid for in advance, so failure to cancel by June 1, 2019 will result in a forfeit of the transportation fees for those weeks. We will be having LITs participating in Camp-A-Palooza field trips as well as LIT-only field trips. 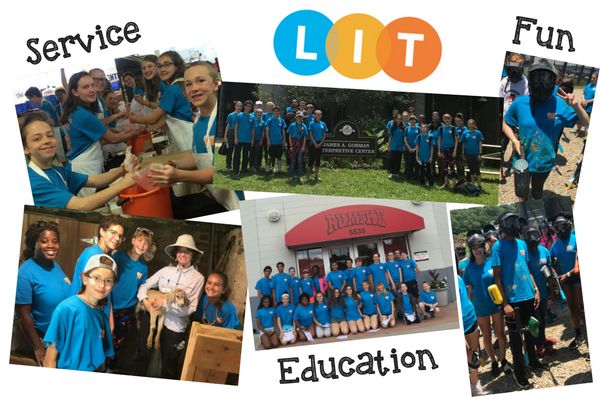 LIT fees include lunches, two field trips each week (covers entry fees and transportation) and staffing associated with the LIT program. If you have any questions, please don't hesitate to contact the Camp Department Leader Megan Smith by phone at 513-489-7575 or by email at msmith@kidsfirstsports.com. Addressed to Megan & Kaitlin - I just wanted to take a moment to let you both know what an incredible experience Daniel had this summer in the LIT program. He developed skills, refined others and learned a lot about himself during the 6 weeks he was an LIT. Daniel had only positive things to say about the people, the program, the choices and activities. Kaitlin, your approach with the teens was ideal and Daniel had a great deal of respect for you. He felt comfortable talking with you if he had any concerns or suggestions and was sure his voice was being heard. He was part of true team and loved being a role model for the younger campers. Daniel is looking ahead and wants to complete the CIT program in the future, possibly another year of LIT too! We want to thank you both for providing such a quality experience for young teens. There are few programs that offer everything a young teen needs and the LIT program is a gem. By combining instruction & education, opportunities for fun, spending time with peers, giving back to others and mentoring younger campers, you have created an inspiring blend. Thanks again for a wonderful summer!